Local government: a new impact investor? Most local authorities would not necessarily see themselves as investors, much less social ones. But why not? Typically, they are one of the largest stakeholders to local businesses, and commissioners are also continually looking for innovative ways of delivering on ‘social impact’. Organisations operating in the social economy are often best placed to deliver on this, but can lack the necessary investment, asking “where is the cheap money?”. New research we’ve published today shows us that this cheap money exists, and can be tapped into by enlightened councils seeking to make investments that deliver both financial and social returns in their local areas. We want to see more local authorities using their balance sheets and access to flexible, long-term finance from the Public Works Loan Board (PWLB) to benefit community businesses. A thriving community business sector can enable cash-strapped councils to continue to meet their objectives. There are many examples of community businesses successfully running public services, providing community spaces and supporting local employment and economic development. A recent investigation by The Times drew on FOI requests to show that councils had invested £2.7bn since 2015 in property acquisition and development fuelled by below-market rate loans from the Public Works Loan Board. That £2.7bn covers very different kinds of investment. The biggest, and perhaps the most startling, is the purchase for £360m by Spelthorne Borough Council of BP’s office complex. Under the leaseback deal, BP is locked into a tenancy for the next 20 years. Spelthorne has not revealed its exact return on the investment, although it has indicated it is in the region of £3m a year. The council’s statement underlines the withdrawal of central government funding and the need for ‘innovation’ in developing revenues to replace it. The FT’s coverage noted, laconically, that the deal is so much larger than the council’s assets and income that Spelthorne has become, in their words, a property company with a sideline in providing local government services. That is one extreme. 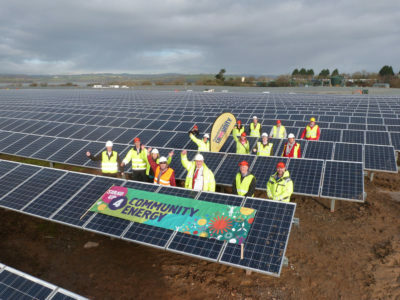 At the other end of the spectrum are the local government investments that support social enterprise and community business: such as Leeds City Council’s investment in Latch (Leeds Action to Create Homes), Plymouth City Council’s investment in Plymouth Energy Community, or Hull City Councils investment in housing with the Goodwin Development Trust. Goodwin Development Trust is a community business employing 200 local people in Hull. The Trust offers a full suite of services, including children’s centres and nurseries, a state of-the-art conference centre, a community college, disability care facilities, sports pitches, a youth and arts centre, performance space, and community meeting rooms. The Trust will shortly break ground on the construction of the city’s first social eco-housing. To do this, Hull City Council offered the Trust a loan at a fixed 3.5% interest rate for 30 years, so that they could finance the housing development, which will provide more than 40 new homes to the community. Hull City Council was able to source the capital required from the Public Works Loan Board. The offer from GDT here is straightforward in many ways – Hull City Council get much needed homes, with GDT providing excellent quality housing at c. 80% of market rates. They will be managed by a long-standing and successful community business, with nearly 25 years of experience of working in the community and in partnership with local statutory and voluntary organisations. The council will get revenue from the development in the form of council tax. And they are lending to an organisation rooted in and responsive to the needs of the local community. This is much less commercial property management, and much more like the core local government function of patiently supporting the local economy. That is both a point about the value – in both monetary, and social, capital terms – of a local authority loan, but also one about the regulatory framework for local authority investment. Section 4 of the Localism Act requires all purely commercial activity to be done via a limited company. If a return is ‘incidental’ to broader social and economic aims, then the clause doesn’t apply. This means that investment in the local economy is – already – explicitly understood as a core part of a local authority’s stewardship of public funds.